We got into the knife business almost by accident. Our first business, Triple C, opened in 1987 building convenience store and deli interiors, fixtures, and display cases out of our space in northeast Minneapolis. Years ago, we built a lot of cases for the Wusthof distributorship, which used to be next door. When it closed, we decided to open up Eversharp and we’ve continued making knife displays for cutlery companies throughout the country. On May 1st, 2007, we opened Eversharp and have since built it into the go-to place for professionals and home cooks. Shoppers make the trip from Madison, from Iowa, and even Hawaii for our selection, expertise, and unparalleled customer service. We’re a local, family owned and operated business. We pride ourselves on not just selling high-quality knives/accessories but also helping educate and finding you the right knife for your hands and your cooking style. Finding the right knife that not only fits your hand but is the right style for what you are wanting to use it for makes cooking so much more enjoyable. We have a unique opportunity to serve chefs and home cooks. Most of us have been here since day one (the majority of our employees have worked here between 10 and 25 years! ), giving us unparalleled knowledge of kitchen tools, brands, and what cutlery is right for the job. With the majority of our employees boasting tenure between 10 and 25 years, you can guess that we love our jobs with an enthusiasm that shines through in customer interactions. We only carry knives, brands and kitchen tools that we love and trust, so whether you’re looking for a limited edition carbon steel Wusthof knife or an inexpensive starter set for your niece or nephew, you’ll get a product that lasts generations at a price you won’t find anywhere else. 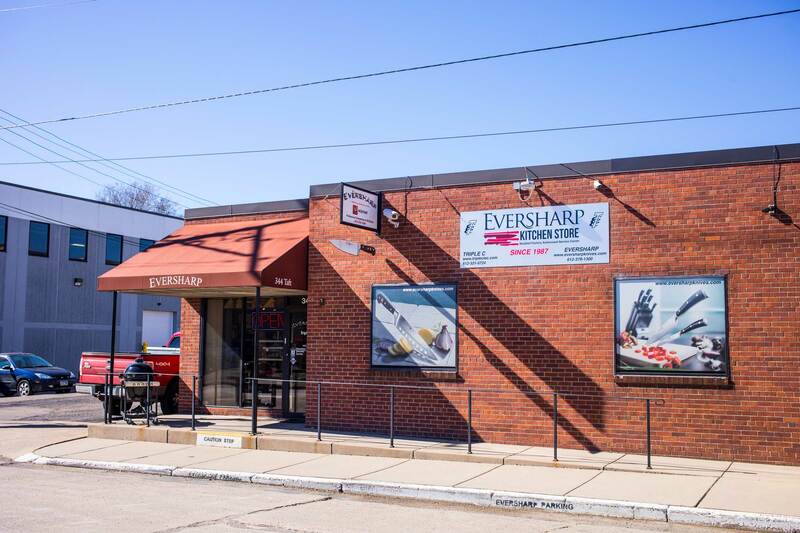 Eversharp is owned and operated by people that have lived and worked in the Twin Cities for generations. As a local and family-owned business, we strongly believe in giving back to our community and neighbors. Twice a year we run a sharpening sale where 100% of all sharpening sales are donated to Finnegan’s Reverse Food Truck/Food Shelf.